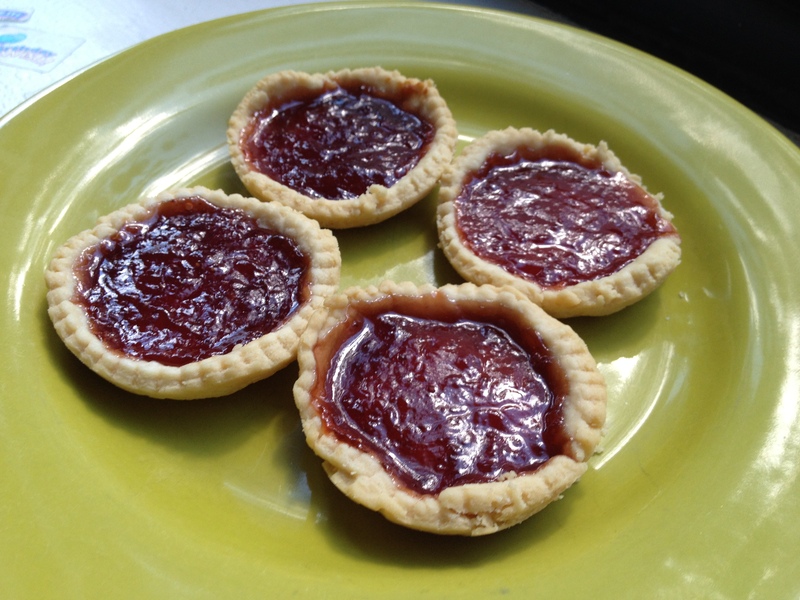 I haven’t made jam tarts since I stepped out of the old kitchen in my childhood home at Bright Street. Yesterday, while searching for an activity to do with five year old Agastya that didn’t involve colorful playdough bits stuck all over the carpet, these buttery jam tarts came to mind. If you are not too fussy about the exact so and so of your shortcrust pastry, this recipe, dredged up from my memory of an old British Ladybird book recipe can be made in minutes with ingredients straight from your fridge and pantry (cold butter, flour, salt and jam), given to a child to roll out and cut into circles and then pressed into a muffin pan to yield delicious mouthfuls of hot jam and biscuit. Even better with some whipped or clotted cream and perfect with afternoon tea. I’ve written about these tarts before here . 1. First, heat oven to 350F and keep your muffin pan ready. Next, chop up the cold butter into little squares. Then rub the butter into the flour-salt mixture with your fingertips until the mixture resembles breadcrumbs — let your small helper do this, but don’t let him or her overwork the dough. Now add water, one teaspoon at a time and keep working the dough until it comes together in a ball. Divide the dough into 4 pieces and set it aside. Work in a cool environment if possible. 2. Place a piece of wax paper on your rolling surface and put one of the dough pieces. Add another piece of wax paper on top and let your child roll out the dough until it’s of a 1/8″ thickness (doesn’t have to be too even). The wax paper will prevent sticking. Now, remove the top wax paper and let your little one cut out circles with the pastry cutter. Remove the circle from the bottom paper and press carefully into the muffin pan with your fingers such that a little basket shell is formed. Collect all the leftover bits of dough and roll again until all the dough is finished. Prick the bottom of the shells all over with a fork — kids love to do this. 3. Place the tray in the oven for about 10-12 minutes, until the edges of the pastry start to look a tad golden. 4. Take out and carefully spoon in a little jam in to each shell. The pan will be hot. Don’t fill too much jam into the cups as this makes the tarts too jammy and sweet. 5. Place back into the oven for several minutes – say 7-10 minutes.